PEMBERTON, B.C. – Residents of the Lil’wat First Nation just east of Pemberton, B.C., are closely watching a grass and brush fire that broke out late Tuesday afternoon. The First Nation set up an emergency operations centre and warned residents of 15 properties to be ready to leave on short notice, although officials say no homes were immediately threatened. The B.C. Wildfire Service says about half-a-square kilometre of bush has been scorched, but it notes the grass fire is extremely smoky and it’s difficult to obtain an accurate assessment of the size. 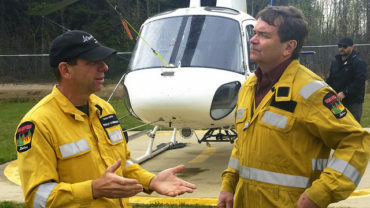 Fire Information Officer Dorthe Jakobsen says a cause of the wildfire has not been determined but the service believes it is linked to human activity. She says the First Nation has lead jurisdiction over the blaze because it is on reserve land but the wildfire service is assisting along with local fire departments. Jakobsen says the fire was out of control on Tuesday night but by Wednesday afternoon it was being held, which means firefighters gained some control over the flames.